Our 8th Premiership! Carlton defeated Essendon by 1 point at the MCG. Fred Stafford kicked the winning goal in the dying moments. Goalkickers: F.Davies 4, J.Baird 3, H.Turner 2, F.Stafford 1, J.Howell 1, R.Garby 1, E.Henfry 1. Best: E.Henfry, F.Davies, J.Bennett, J.Clark, J.Howell, O.Grieve, F.Stafford, R.Green. Reports: Nil Injuries:O.Grieve (eye injury), G.Bailey (knock on knee), K.Baxter replaced B.Deacon (cramps) last quarter. Logic would dictate that the 1945 Premiers and the 1946 Premiers should battle it out to win the 1947 Premiership. Carlton and Essendon had been the form teams all year, finishing as the top 2 on the ladder. Two weeks ago, the Blues won a tough Semi-Final to gain a much-needed week's rest before the big game. The first half was in the main dominated by Essendon, although with 11 more scoring shots, the Bombers led by a mere 11 points. That margin was sustained through to the Three-Quarter-Time break, both sides having kicked 2.4 in the third quarter. Late in the match, though, captain Ern Henfry swung Ken Baxter into the ruck. This move helped swing the game, but with only a minute to go, Essendon were still 5 points in front and looked likely to be the premiers for the second year in a row. Enter Fred Stafford. The flanker grabbed the ball and flung it onto his boot, and the ball sailed through the goalposts to put the Blues in the lead. Mere seconds later, the bell rang, and Carlton had won their 8th Premiership and their second in two years. Fred Davies kicked 4 goals. Jim Clark and Jack Bennett were strong in defence, providing plenty of dash. Fittingly, Stafford (along with other surviving teammates) was on hand to finally receive the 1947 Premiership Cup at the Princes Park Farewell Game in Round 9, 2005. This match would have a thrilling replay over half a century later when Carlton and Essendon did battle in an epic Preliminary Final. Again, the mix of Essendon inaccuracy and Carlton spirit created a 1-point margin to the Blues. In retrospect the move that won Carlton the Flag was the appointment of Ern Henfry as captain. In the Grand Final he was as cool as the weather was warm, before a lock-out crowd of 85,815*, as Carlton stuck with Essendon in the first half by kicking straight. At half-time it was 8.0 to 8.11. The Bombers had burned a lot of fuel. In a gruelling third quarter both teams kicked 2.4, and with ten minutes to go in the last Essendon were still 12 points in front. 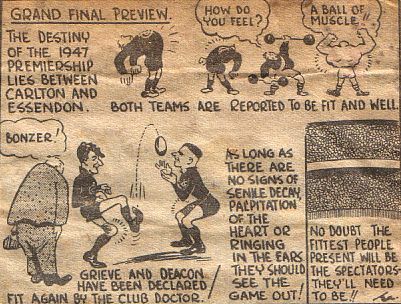 Suddenly Carlton became energised, and Henfry and Jack Howell and Ken Hands, finally overcoming the resistance of Essendon's gallant Wally Buttsworth, combined to set up a goal by Fred Davies and then a miss from 15 yards. Ken Baxter replaced injured Bert Deacon and was swung into the ruck in the last nine minutes. With 44 seconds to go, five points the difference, Baxter charged into a boundary ruck contest in the forward pocket, and got the ball out to an unguarded Fred Stafford who snapped a left footer through. The bell rang, and Carlton had won by a point, a delirious 13.8. (86) to Essendon's dumbfounded 11.19.(85). - 100 Years of Australian Rules Football. "With less than 10 minutes to play, and 12 points down, Carlton's prospects of success appeared far from bright. Then, as if waiting for a well planned signal, the whole team sprang to life for a final do-or-die effort, which succeeded by sheer desperation. Bennett, in defence, worked like a trojan to keep Carlton forward, Howell became a revitalised force in the ruck, Henfry gave drive from the centre, while Baird's activity and pace at centre half forward became factors, emphasised by the tiredness of Buttsworth, of the Essendon defence. Also Hands, previous unsighted, flashed into play with timely marks. In addition, the placing of Baxter, a fresh man, in the ruck, in the final few minutes, was a well time stroke of strategy, Baxter had replaced Deacon. Tensed with great excitement the crowd cheered every thrust in the last few minutes. Outmanoeuvring Ruddell to mark cleverly, Davies first goaled to leave Carlton 6 points down. Towering high over the pack, Howell marked beautifully, but Buttsworth was in the way, Hands then had a chance, but Ruddell brilliantly saved at the goal base. Undeterred, Carlton again swarmed forward for Davies to mark 15 yards out. Groans of anguish followed his easy miss, leaving Carlton 5 points down. From a free 40 yards from goal, Baxter failed to get the vital distance, and with time running dangerously short, Reynolds cooly marked to give Essendon respite and hold up play. But Essendon, exhausted, could not advance far, and again Carlton stormed forward for Hands to flash in and mark. Distance again proved beyond him, and eagerly Essendon swept the ball out of bounds. Over anxiety proved Essendon's downfall, Stafford was left unguarded. A heavy pack flew for the ball. It was tapped to the ground, Stafford flashed across, snapped it up and screwed home cleverly a brilliant left-foot snap to give Carlton the lead in the match. Essendon was dumbfounded and Dons' supporters bewildered." Contributors to this page: blueycarlton , WillowBlue , Bombasheldon , pblue , molsey , timmyd , sherb , BlueWorld , camelboy , steve , thehalford and admin . Page last modified on Tuesday 19 of January, 2016 08:20:41 AEDT by blueycarlton. 1981 Rd 8 Mike Fitzpatrick. 2001 Rd 3 - Matthew Lappin.